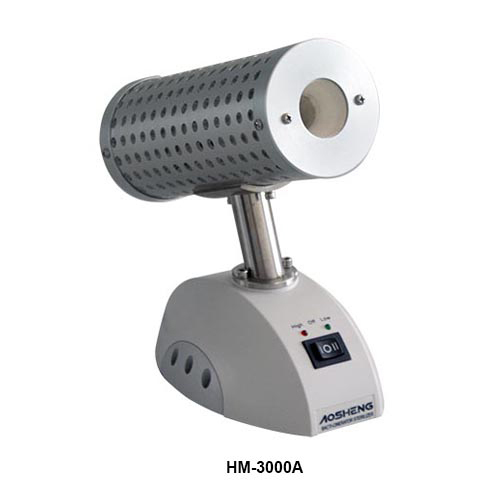 HM-3000A bacti-cinerator sterilizer sterilizes micro-organisms utilizing infrared heat produced by a ceramic core element. The ceramic element contains no asbestos and ensures maximum sterility without splatter across the work surface area. Complete sterilization occurs within 5-7 seconds at optimum sterilizing temperature of 1500ºF (815.6ºC). The small footprint makes the Bacti-Cinerator Sterilizer an ideal instrument for anaerobic and aerobic chambers alike. Several user friendly accessories are also available for the Bacti-Cinerator sterilizer.HM-3000A bacti-cinerator sterilizer sterilizes micro-organisms utilizing infrared heat produced by a ceramic core element. The ceramic element contains no asbestos and ensures maximum sterility without splatter across the work surface area. Complete sterilization occurs within 5-7 seconds at optimum sterilizing temperature of 1500ºF (815.6ºC). The small footprint makes the Bacti-Cinerator Sterilizer an ideal instrument for anaerobic and aerobic chambers alike. Several user friendly accessories are also available for the Bacti-Cinerator sterilizer.HM-3000A bacti-cinerator sterilizer sterilizes micro-organisms utilizing infrared heat produced by a ceramic core element. The ceramic element contains no asbestos and ensures maximum sterility without splatter across the work surface area. Complete sterilization occurs within 5-7 seconds at optimum sterilizing temperature of 1500ºF (815.6ºC). The small footprint makes the Bacti-Cinerator Sterilizer an ideal instrument for anaerobic and aerobic chambers alike. Several user friendly accessories are also available for the Bacti-Cinerator sterilizer.